I already mentioned, a monopolist can practise price discrimination by dividing his market into submarket and charging different prices in the monopolist can keep these sub-narke absolutely separate. According to Pigou, there are two main conditions for this purpose:- it should not be possible to transfer any unit of the commodity from one sub-market to another. That is. the goods sold in the cheaper market cannot be resold in the dearer market. otherwise monopolist’s purpose will be defeated. Secondly, it should not be possible for the buyers in the dearer market to nea into the cheaper market lake advantage of the low 1″ice. For example, it patient, who is really rich, should not be able to pass as a poor person to avail him elf of the lower fee charged by a doctor from the poor patients. 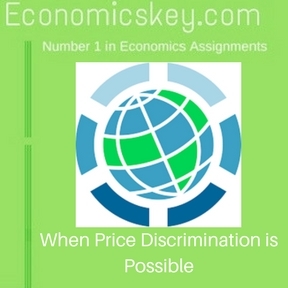 For the monopolist to keep hrs sub markets separate to successfully practice price discrimination is possible under the following conditions: (i) When Shave certain preferences prejudice. Certain consumers, especially belonging to thc upper class, usually have the irrational feeling that they are paying higher prices for a good be- cause it is of a better quality. although actually it be of the same quality. As Mrs. Joan Robin-on observes, “various brands of a certain article which in fact arc almost alike may be sold as different qualities under names and labels which induce rich and snobbish buyers to divide themselves from the poor buyers, and in this way the market is split up and the monopolist can sell what is substantially the same thing at different prices.